From the Spring 1962 issue of the Collins Signal magazine. At the world's most famous shooting gallery - Cape Canaveral, Florida on January 15 of this year, officials of the National Aeronautics and Space Administration shook their heads as they examined television pictures of their ill-fated AVT-1 balloon. Lofted by a Thor missile on a 550-mile down-range pre-orbital test flight, the 135-foot diameter balloon exploded into shreds at an altitude of 200 miles, after expanding too rapidly in the vacuum of space. 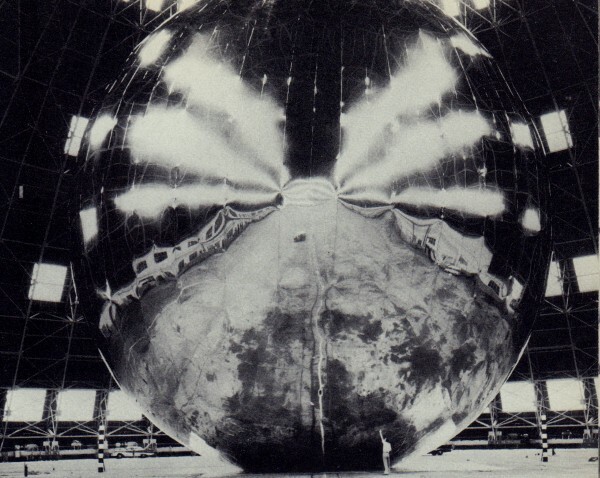 The shattered balloon altered, but did not cancel, the plans of Collins engineers and technicians assembled in the Company's Space Tracking station at Cedar Rapids, Iowa. Undaunted by the mishap, the Collins crew was able to track and bounce signals from the fragments of the AVT-1 sphere, receiving reflected radio signals of "good quality." The Collins experiment consisted basically of tracking the balloon's remnants by radar, sending a 10,000-watt radio signal of 810 mcs toward them by means of a 28-foot parabolic antenna and receiving the reflected signal. The task was another step in a continuing Collins space program designed to study the use of satellites for communication purposes. Long range objective of the studies is to determine the feasibility of improving inter-continental and other long distance radio communication by means of space orbiting satellites. Collins made dramatic space communication history in August, 1960, when teams of research engineers at the Company's Dallas and Cedar Rapids Space Tracking sites became the first to conduct two-way live voice communication using the orbiting passive satellite Echo I balloon to reflect radio waves. Collins research engineer makes last minute adjustment on receiving equipment at Cedar Rapids station prior to launching of AVT-1. 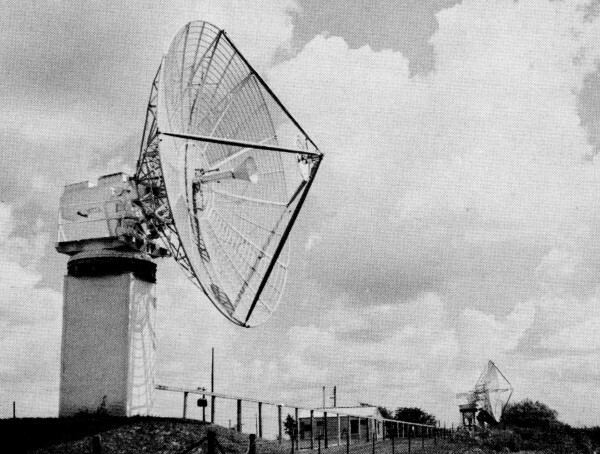 This 40-foot parabolic space tracking antenna at the Collins Richardson, Texas, facility was utilized in receiving signals bounced off Echo I. This was not a new area for Collins, since as far back as 1951 the Company had participated in experiments using the moon as a passive relay for communication between two points on earth. Communication by reflecting signals from a moving spherical object required antennas which would track the object, high-gain receivers with low noise levels, and transmitters to provide the signal for reflection. The most conspicuous equipments used in the Echo I experiments were the antennas. Three 28-foot parabolics were installed; one receiving and one transmitting antenna at the tracking station in Cedar Rapids, and the other, a transmitting antenna at the tracking site adjacent to a Collins plant in Richardson, Texas. For receiving, the Richardson facility used a 40-foot azimuth-elevation tracking antenna, to which the transmitting antenna was slaved. Transmitting equipment used in the Echo I experiment included the Collins 240D-l 10-kw power amplifier driven by a modified 310K-3 FM exciter. This equipment and the associated 28-foot transmitting antenna was capable of operating between 800 and 1000 mcs. Output from the power amplifier was applied directly to the transmit antenna. Provisions were made for applying FSK teletypewriter, voice and single frequency inputs to the exciter for experiments with various types of modulation. Receiving equipment consisted of a position-tracking 810-mc microlock receiver and four phase-lock receivers tuned to 108, 20, 40 and 60 mcs. The 108-mc receiver was a Collins 50P-l modified for microlock service. It provided outputs used to measure signal strength and phase of the received signal. Three Collins 51J-4's modified for phase-lock service were used with appropriate converters to tune 20, 40 and 60 mcs. With converter and VCO modifications, these receivers could be used at any frequency between 15 and 60 mcs. They were used as measurements of received signal strength and phase. 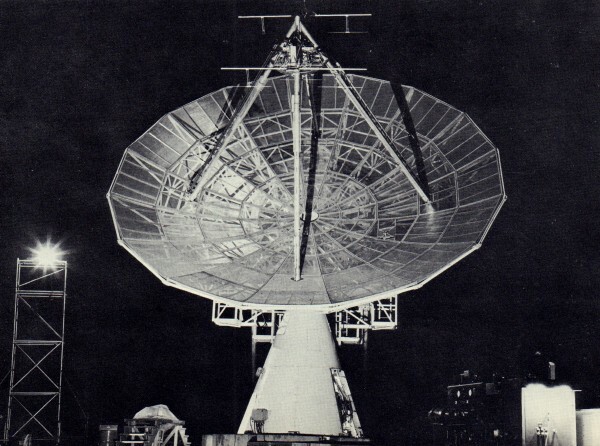 At 3:04 a.m. (CST) on August 13, 1960, as Echo I rose in the northwest on its eleventh orbital trip, antennas were locked on at the transmitting stations. In Texas, Al Richmond, a project engineer for Echo, spoke into the mike: "This is KK2XlC in Richardson, calling KA2XDV in Cedar Rapids, Iowa. Do you read me Cedar Rapids?" The answer came from a Collins engineer: "This is KA2XDV in Cedar Rapids, Iowa, calling KK2XlC in Richardson, Texas. We are receiving you" And the first two-way radio voice transmission via artificial satellite was accomplished. Echo I balloon when inflated towered higher than a l0-story building. Skin consisted of aluminized Mylar plastic. Although damaged, sphere is still orbiting. 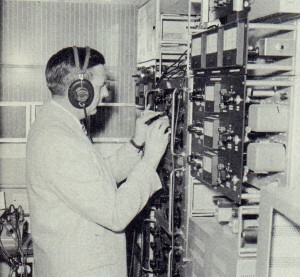 Engineer checks receiving equipment at the Richardson, Texas, tracking station. Receiving antenna is in background. The following week the Collins teams achieved another "first." Working with photo transmitting equipment supplied by the Associated Press, a wire-photo of President Eisenhower taken the previous day in Washington, was transmitted by Echo satellite from Cedar Rapids to Dallas. According to most predictions at the time of launching, the aluminum coated satellite was destined to stay in orbit barely more than two weeks. But the balloon, though somewhat compressed and warped, is still orbiting and still serving a useful scientific purpose. Today the reflection characteristics of the Echo I balloon are considerably different from those existing when it was first launched. Through interpreting characteristics of their returned radio signals, Collins researchers estimate the balloon has deflated to about one-half its original size. When launched, its diameter was equal to the height of a 10-story building. Because of the fading characteristics of radio signals, scientists also conclude the balloon is wrinkled and caved-in. Tough old Echo I also has dropped in altitude and slowed down a bit. The Smithsonian Institute now estimates it may continue to decrease its orbital distance from the earth until late this year or 1963 when the heavier atmosphere close to earth will cause it to disintegrate. But whenever the Echo I balloon might disappear, scientists agree it has served its purpose beyond all expectations. "We've learned a lot more about atmospheric drag and solar pressure in space," one Collins scientist reports. Reviewing the results of their experimentation with Echo I, the researchers report: (1) The study confirmed that a radio bandwidth of at least 1.5 mcs and probably greater can be transmitted and received via the balloon bounce method - which means certain types of television transmission and very high speed data are easily transmittable via this method; (2) The atmospheric interference which disrupts present-day short wave global radio transmission has no effect on the transmission quality of signals bounced from the satellite reflector; (3) Transmitting teletypewriter messages, wire-photo facsimile photographs, as well as music and voice is feasible over this type of balloon bounce circuit; (4) The studies confirmed certain theories of radio propagation which formerly had never been proved by experimentation and observation. The net result so far, according to Collins engineers, is that the experiments give a definite indication of the feasibility of developing a satellite communication system which would improve world-wide radio communication quality. But satellite researchers are the first to agree .that they have merely "scratched the surface" in developing a fully operational global communication system based on the use of passive satellites. Future experiments which Collins plans to undertake in its space communication research facilities include participation in the NASA rigid satellite balloon Echo II project (its prototype is the balloon that exploded at altitude); participation in NASA's Project Rebound which will again attempt to orbit several passive satellites at one time for communication study; and participation in a project to analyze radio signals transmitted from an active satellite. Facilities used for Project Echo experiments will be utilized by Collins researchers to conduct independent research in exploring and analyzing tropospheric scatter transmission methods and the study of the effect of weather on certain methods of radio transmission. 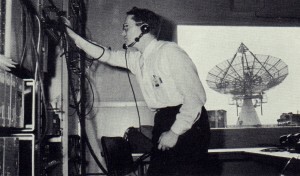 The Collins Space Tracking Station at Cedar Rapids utilized two 28-foot parabolic antennas.